Ex-Display. Item shown is in the cream finish. Fully assembled. Dimensions H106.7cm x W39.4cm x D39.8cm (Delivered within 1-4 weeks). Finish in distressed French oak and constructed to a high standard and dovetail drawer fronts. This french style rustic oak range is an exquisite collection at affordable prices. Fully assembled. Dimensions H118cm x W53cm x D41cm (Delivered within 2-4 weeks). Finish in distressed French oak and constructed to a high standard and dovetail drawer fronts. This french style rustic oak range is an exquisite collection at affordable prices. Fully assembled. Dimensions H92cm x W96cm x D42cm (Delivered within 2-4 weeks). Finish in distressed French oak and constructed to a high standard and dovetail drawer fronts. This french style rustic oak range is an exquisite collection at affordable prices. Fully assembled. Dimensions H120cm x W98cm x D44cm (Delivered within 2-4 weeks). Finish in distressed French oak and constructed to a high standard and dovetail drawer fronts. This french style rustic oak range is an exquisite collection at affordable prices. Fully assembled. Dimensions H77cm x W152cm x D44cm (Delivered within 2-4 weeks). 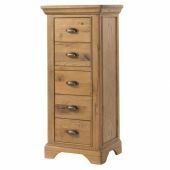 Finish in distressed French oak and constructed to a high standard. This french style rustic oak range is an exquisite collection at affordable prices. Fully assembled. Dimensions H52cm x W91cm x D48cm (Delivered within 2-4 weeks). Ex-Display. Venice Oak 4 Drawer Chest. 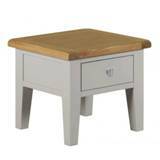 Carefully crafted in oak, with a modern contemporary designed finish. 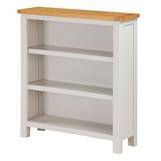 Constructed with dovetail drawer fronts and tongue and groove bases and cabinet backs. Finish in a light oak stain with lacquered finish. Fully assembled. Dimensions H100cm x W85cm x D45cm (Delivered within 1-6 weeks depending on location). Modern grey gloss fronts with light oak effect cabinet. Manufactured from composite board and plastic veneer. Metal drawer runners, metal handles. Self Assembly. Dimensions H93cm x W50cm x D40cm (Delivered within 2-4 weeks). 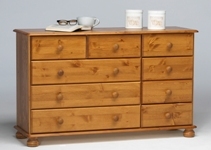 Ex-Display Sherwood 4 Drawer Chest in oak finish and enhanced with quality metal bar handles. Manufactured from melamine faced fibre board. Made in the UK. Fully assembled. Dimensions H88.5cm x W76.5cm x D41.5cm (Only one available) (Delivered within 1-6 weeks depending on location). Ex-display Clearance item. Satin lacquered oak top with modern grey stone painted cabinet and drawers. Dovetail drawer fronts with stylish nickle cup handles. Fully assembled. Dimensions H92cm x W80cm x D40cm (Delivered within 1-6 weeks depending on location). 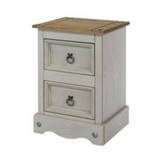 Annecy 2+3 Drawer Chest by Corndell. Fully assembled. Dimensions H102cm x W88cm x D42.5cm (Delivered within 6-8 weeks). Annecy 6 Drawer Tall Chest by Corndell. Fully assembled. Dimensions H144cm x W53cm x D42.5cm (Delivered within 6-8 weeks). Annecy Blanket Box by Corndell. Fully assembled. Dimensions Hcm x Wcm x Dcm (Delivered within 6-8 weeks). 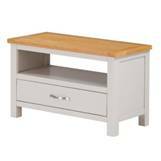 Annecy 3+4 Drawer Extra Wide Chest by Corndell. Fully assembled. Dimensions H95cm x W124cm x D42.5cm (Delivered within 6-8 weeks). Manufactured by Corndell. Fully assembled. Dimensions H93.5cm x W118.5cm x D43cm. (Delivered within 4-8 weeks). Manufactured by Corndell. Fully assembled. Dimensions H74cm x W118.5cm x D43cm. (Delivered within 4-8 weeks). Dimensions H133cm x W63cm x D43cm. (Delivered within 4-8 weeks). Manufactured by Corndell. Fully assembled. Dimensions H93.5cm x W81.5cm x D43cm. (Delivered within 4-8 weeks). Manufactured by Corndell. Fully assembled. Dimensions H114cm x W81.5cm x D43cm. (Delivered within 4-8 weeks). 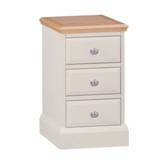 New Quercus 3 Drawer Narrow Chest. Dimensions: H 29.5" x W 24" x D 17.75". New Quercus 4 Drawer Narrow Chest. Dimensions: H 37.75" x W 24" x D 17.75". New Quercus 5 Drawer Narrow Chest. Dimensions: H 46" x W 24" x D 17.75". New Quercus 6 Drawer Narrow Chest. Dimensions: H 54.25" x W 24" x D 17.75". Dimensions: H 29.5" x W 36" x D 17.75". Dimensions: H 37.75" x W 36" x D 17.75". Dimensions: H 46" x W 36" x D 17.75". Dimensions: H 54.25" x W 36" x D 17.75". Dimensions: H 21.25" x W 48" x D 17.75". Dimensions: H 29.5" x W 48" x D 17.75". Dimensions: H 37.75" x W 48" x D 17.75". Dimensions: H 46" x W 48" x D 17.75". Dimensions: H 19" x W 36" x D 17.75".